With the highly-anticipated World Cup 2018 draw not too far away, some of the biggest football brands have been dropping new international kits almost daily. Well, we’re taking a look back at some of the greatest to ever light up the biggest competition in football. Lately, it seems that we can hardly walk down the street without a new international kit being released. The highly-anticipated World Cup draw is set to take place on December 1st, with some of the biggest international teams on the planet eagerly waiting to find out their fates. Despite the fact that the likes of Holland, Italy and Chile have all missed out on a place at next year’s tournament, it’s fair to say that hype over the competition is at an all-time high. So, it’s been the perfect time for adidas, Puma and other big brands to go ahead and release a shed-load of awesome international kits, all specially designed for the Russia World Cup as teams look to write a new chapter in their country’s history. It’s one of the most iconic football kits to ever grace the FIFA World Cup, and that’s exactly why it’s positioned right here at the top of our list. So, it’s a good job the Germans did the shirt justice and went on to when the whole damned thing. Who could forget Gazza’s tears, eh? 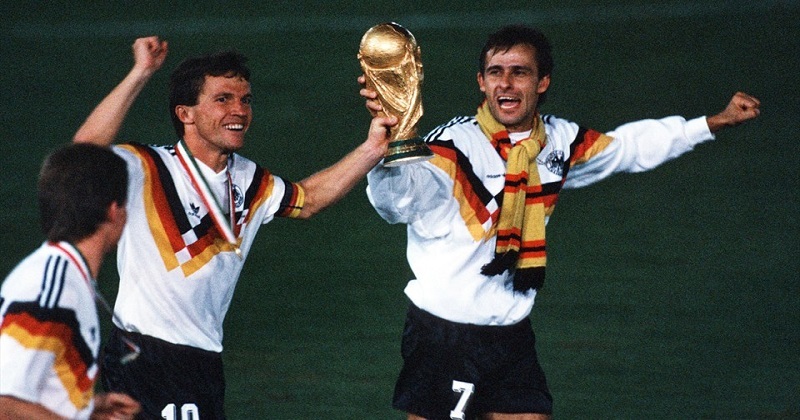 Sporting the infamous white that has become synonymous with the German kits down the years, the 1990 edition featured the colours of the German flag in a dazzling pattern across the chest. Still being sponsored by adidas way back then, this 25-year old gem of a football kit still looks absolutely incredible even by today’s standards, and is a firm favourite of any lovers of classic football shirts. The striking shades of red, black and yellow being shown off by Klinsmann and Voller was always going to have a huge effect, and this Germany football kit set the precedent for the other classic shirts we enjoyed in the 90’s. We just can’t talk about classic World Cup kits without mentioning the strip worn by England at the 1966 World Cup. 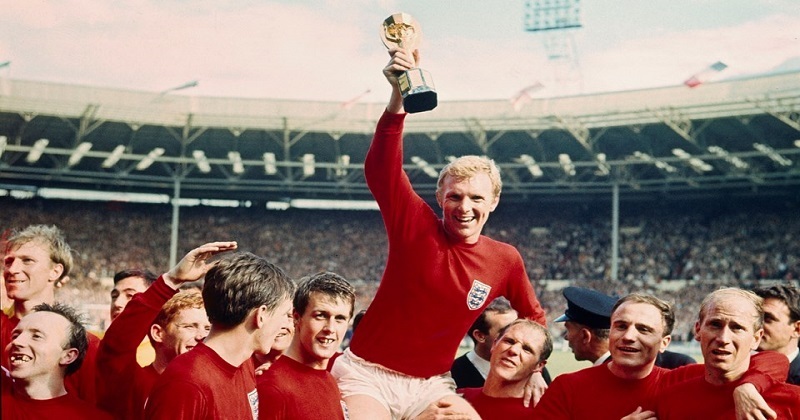 The image of Bobby Moore being held aloft as England showed off their trophy is something that will be ingrained on the minds of football fans for generations to come- and that iconic red kit is right at the heart of it. Back in the days when kits were much more minimalistic and bore no sponsors or brand logos whatsoever, the England 1966 kit is perhaps the most popular, truly retro football kit on the planet. Emblazoned with the famous Three Lions crest, this red number certainly didn’t fail to shout about the pride of the English nation, as they hosted (and lifted) their one and only FIFA World Cup. Well, when you’ve gone from Charlton and Moore to Henderson and Dier- something tells us we might be left waiting a little while for any additions to our trophy cabinet. Is it humanly possible to talk about the World Cup without giving Brazil a mention? We don’t think it is, especially when we’re talking about iconic football kits. The Brazilian national team has always been famous for its vibrant football kits and flamboyant style of play, with their extravagant shades of yellow perfectly mirroring their extravagance and skill. When you think of the World Cup, you think of the iconic Brazilian yellow. It’s their 1982 football kit that makes its way onto our list here, but the fact of the matter is we could have probably included just about any other Brazilian kit instead. The yellow and green colourway combined with the infamous Brazilian crest combine to create one of the most famous World Cup-looks in history. 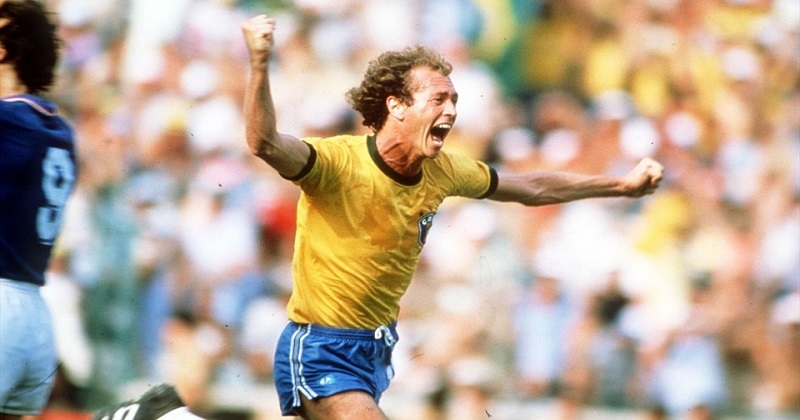 The 1982 kit was worn by Brazilian legends such as Zico and Socrates, establishing itself as one of the best ever- despite the fact they didn’t get close to winning the competition. 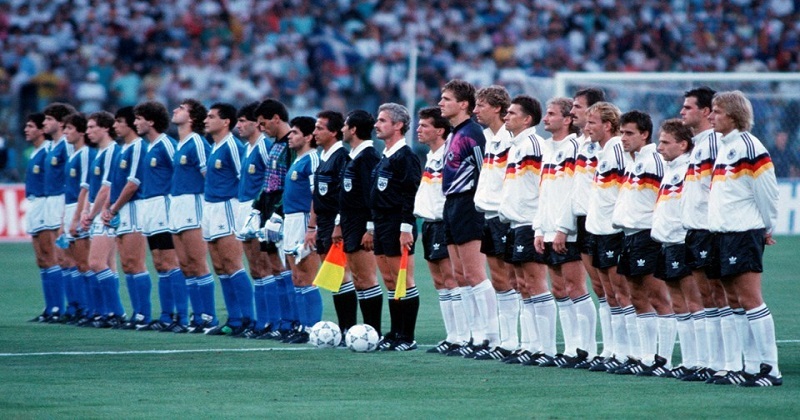 What are your favourite ever World Cup football kits? Whatever it is- we can guarantee you’ll be able to find the best prices right here with FOOTY.COM. With most of the 2018 World Cup kits paying homage to days gone by, we look set to get a blast from the past when it all kicks off in Russia this June.